While driving through Virginia on Interstate 81, I noticed a beautiful old stone arched bridge. Though no tracks remained in the area, the terrain begged for a rail line. With some research it was discovered that this bridge was on the National Registry of Historic Places. The bridge was built in 1884 and was part of the Valley Railroad which eventually became part of the Baltimore and Ohio Railroad. 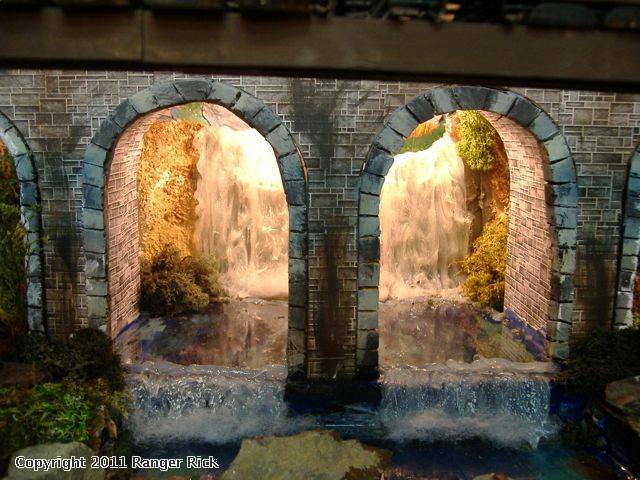 Putting in a replica of that bridge helped solve a bridge problem in the river valley of the layout. I designed the bridge out of two pieces of one inch pine. A friend cut out the arches using a band saw. I assembled the two sides using 1x4's. The outside was covered with a textured stone-like paper from Micro-Mark. I used cardstock to print stone-like untextured paper to be glued to the inside of the arches. i then used one inch pink foam insulation to make the stone block around the arch and the top and painted it shades of stone gray to complete the bridge. To me bridges are just incredible, especially stone arch bridges, they are so majestic, simply spectacular structures, and they (to me anyway) age with such grace and beauty. I have made a few in my day. Here is probably my most treasured one, as I built it just after something adverse happened in my life that later turned out for good, and whenever I look at it, I am reminded of how much we have to be grateful for. It is made almost entirely of extruded polystyrene building foam, with some wood inside, although it didn't really need any wood, as it is one strong bridge, just as foam. I hope you and the members here enjoy the picture.